HAMMERSHUS is built for the islander’s freight corridor and as a cornerstone in the locale tourist industry. It took Molslinjen 803 days from the contract was signed with the Danish State for the public funded ferry service of Bornholm on June 21, 2016, to the newbuilding HAMMERSHUS had its premiere on The Baltic Sea September 1 last year. From that date, Molslinjen, under the new brand Bornholmslinjen, was the operator of a ten-year concession with options for two years extensions. One of several independent lounge areas in starboard side, but still a part of the open plan covering the whole front fire zone. Above: The cafeteria area with 400 seats as well as the other lounge areas, works in practice as a single area, but with the feeling of being in smaller, more delimited spaces. It is the Finnish interior designer Aprocos Interior Design who is responsible for the interior. 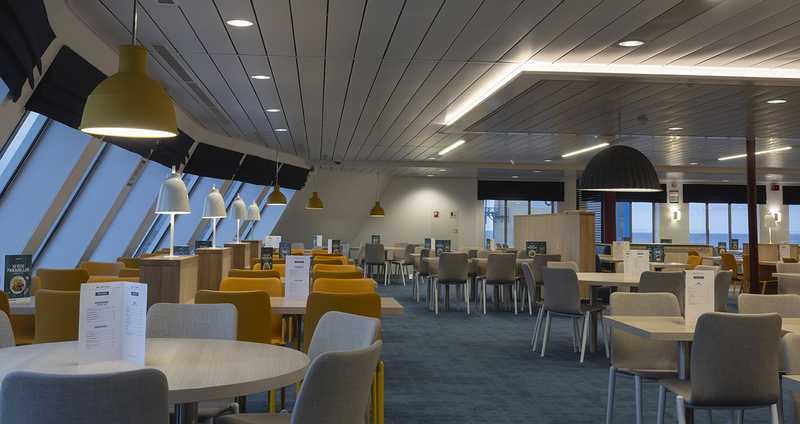 The white bulkheads, and by daylight the many large windows, creates a very bright environment, where only a few strong colours are used, mainly yellow. While Molslinjen could meet the contract’s requirements for high speed tonnage on the Rønne – Ystad-route route with two modified InCat catamarans from the operation on Kattegat, the company choose to bid with a newbuilding for the much more freight-oriented Rønne – Køge-route, where a conventional ro/pax-ferry was obligatory. Ro/pax tonnage is often very specialized for a specific route, and in 2016 that type of ships were largely non-existent on the second-hand market, at least if it were to be a relatively modern ship. Another part of the cafeteria placed over the centreline in the middle of the one large passenger complex. The open plan concept is sustained by the semi open partitions, dividing each area. Molslinjen had therefore beforehand secured a basic design and a building-slot at the Finnish shipyard RMC (Rauma Marine Constructions), which meant that the contracting could be made immediately after the final signature on the concession. The cafeteria counter is part of the same complex as the information desk, out of the picture to the right. A function that saves crew resources and which was also used on the former ro/pax-ferry on the route, HAMMERODDE. HAMMERSHUS is therefore in its outset highly specialized for the Rønne – Køge-route, which means that the ship is designed to meet several very specific requirements in the contract with the Danish State. The two main, minimum, capacity requirements are 1,500 lanemeters and 400 passengers. As a result, HAMMERSHUS stand out from otherwise newly built or contracted ro/pax-ferries. Not least in relation to the comparatively small trailer capacity that is just necessarily met. The main stair case connection deck 7 and 8. On the other hand, during the construction at RMC, Molslinjen choose to expand passenger capacity by as much as 80 per cent, so that HAMMERSHUS can accommodate 720 passengers. On starboard side 200 recliner seats, where from the middle section of chairs are view to large TV screens. In the port side, there are 100 resting places where the passengers can lie down. This option dates all the way back from the state-owned Bornholmstrafikken on the two conventional night ferries POVL ANKER and JENS KOFOED and is continued on HAMMERSHUS. Both the recliner seats in starboard side and these berths on deck 7 are free of use and do not require any booking, which contributes to a great flexibility in the multi-functional operation of the ferry. A capacity that can rarely be utilized on the Køge-route, but which is crucial for Molslinjen to being able to act profitably all year on the purely commercial route between Rønne and Sassnitz in Germany. A route not included in the concession, but which the former operator Danske Færger has managed to establish and build up to great benefit for the island’s tourist industry, and which Molslinjen now will operate throughout the year. The daily early morning arrival at Rønne from Køge. HAMMERSHUS departs Rønne for Sassnitz. Since the route has so far been largely a car and passenger route targeted at the German tourist market, some utilization of the 1,500 lanemeters on the car deck consequently also requires a passenger capacity of some size when the new ferry is mainly loaded with passenger cars in Sassnitz. There are traditional passenger cabins on deck 8 with private facilities. The requirement for berth capacity in the contract is a total of 67 including special allergy-friendly and disabled-friendly cabins. Molslinjen has chosen to specify the ferry to a near-minimum requirement, which gives a total of 16 four-person outside passenger cabins, and in addition two that meets allergy and disability needs, with a total of 72 berths. HAMMERSHUS is therefore partly a result of some minimum requirements in a contract – and partly a wish to incorporate extra capacity and flexibility into a purely commercial-based route. In practice, HAMMERSHUS’s 24 hours-cycle starts in Køge Harbour with departure for Rønne every night at 0:30. The arrival at Rønne is at 6:00. Then most days there are departures to Sassnitz at 8:00 with arrival at 11:20. HAMMERSHUS has a traditional ro/pax layout with two trailer decks, where deck 5 partly has a open weather deck section for certain categories of dangerous freight, and partly a semi-open area under the accommodation. The lower trailer deck is on the main deck. The two decks are internally connected by two fixed ramps in each side. Here a view aft on deck 5. And here also a view aft, but on the main deck. There are three lanes on each side of the center casing, which also makes it possible to turn trailers and trucks on both trailer decks. Thus, HAMMERSHUS has no bow port, but only the 16.5-meter-wide ramp aft on the main deck. The ferry only takes 30 minutes to turnaround in Germany before returning to Rønne with arrival at 15:10. This then gives a window of 110 minutes until the 17:00 Køge departure, and not least to load outbound trailers as well as the limited number of passenger cars and passengers who choose the Køge-route over the main passenger corridor; the via-Sweden Rønne – Ystad-route. The 24-hour cycle then ends with arrival at Køge at 22:30. HAMMERSHUS just after its morning arrival in Rønne. And here alongside the high speed-ferry EXPRESS 1, which in a few minutes will depart on its first crossing of the day to Ystad in Sweden. The main machinery consisting of two 8-cylinder Wärtsilä W31 four-stroke engines is in fact a world premiere. Delays in two other newbuilding projects, a trawler and an icebreaker with the same machinery, make HAMMERSHUS the world’s first commissioned ship with this newly developed engine type. To the left auxiliary machinery from Nordhavn and to the right ABB’s latest generation of two-stage (high- and low-pressure) turbochargers that cover wider motor load, thus also being a central part of the ferry’s optimized energy efficiency. In the consumer chain on board, LED lighting is also widely used, which consumes considerably less power than conventional lighting. The two 1,500 kW thruster motors from ABB in the fornt on deck 2. The contract requires that HAMMERSHUS must be able to maneuver safely in and out of the ports of Rønne, Ystad and Køge in middle winds of up to 23 meters per second. Yet another afternoon crossing from Bornholm to main land Denmark.